I was given a copy of this free for my honest review on Goodreads, my Shut Up & Read group. I must say I was surprised. The blurb describes the story very aptly but the author gives you enough to enjoy the adventure. It's your typical Post Apocalyptic story format with a love twist. Much of the story was expected. We know what happens if you read this genre of story. Bad guys come, do damage, rest of the world tries to survive. What makes reading these fun is who the bad guys are, how the damage is done and how the world adapts to survive. 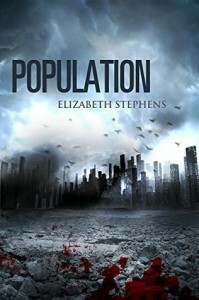 The author has to give you a reason to read the story and Elizabeth Stephens does that very well. Our main character, Able, tells her story and throughout the trials gives us her rules for survival. I admit I'm not a fan of first person narrative. It's difficult for me to see myself doing the action and such, but there is enough detail within the fight scenes and running for your life scenes that even my 50 year old body could picture doing something like that, especially after 12 years of this world. I do like the rules for survival and how Stephens shows true adaption as they change throughout the story. Probably a bit too quickly on the changes. That would be the only flaw for me on how quickly Able goes from trying to kill our evil monster, Kane, to falling in love with him. I think I would have liked to have seen more of the Population side of the world before we go to Kane's side and safety or not total safety as the story ends well setting up the second book. I'm looking forward to the second story and do hope it doesn't disappoint and comes with as much action as the first. It did only take me two nights to read this. It was that smooth of a read.